I believe that most, if not all, major EN>IT IT>EN dictionaries are now available on CD-ROM or at least with CD-ROM available (in addition to the paper dictionary). I don't have a link for the Ragazzini (Zanichelli), but the Picchi (Hoepli), Rizzoli-Larousse "Sansoni" (which, sadly, does not contain the full text of the great Sansoni-Macchi), and Hazon-Garzanti are now available online. Of the above, I think the best and most complete general English-Italian dictionary nowadays is Picchi's, closely followed by Rizzoli-Sansoni. Using these dictionaries "for free" online is tempting, and occasionally useful. Remember, however, that the CD-ROM versions have some important advantages: faster searches, availability even when you are not online, and additional functionality, (much richer search capability, from full-text searches to the use of boolean operators). I've added to the body of this post another two online dictionaries, Oxford-Paravia Concise and Collins, which have been suggested by colleagues. I will probably write a comparison review of these online dictionaries in a future post. Thank you for this wonderful dictionary gift, I hope they will help me a lot in translation, But I was wondering are there any program available that can translate a poem or an article? Thanks for the kind words. 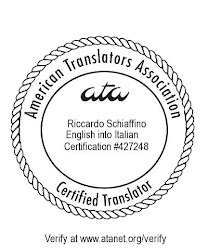 As regards programs available to translate a poem or an article - if you are thinking of machine or automatic translation, the available programs usually do little better than a rudimentary gist (except maybe in some very specialized and restricted domains). You could try Google Translate, but I doubt you'll find the results very helpful, certainly not for poetry. Besides advantages such us faster searches, off-line availability and much richer search capabilities, the main difference between paper/cd dictionaries and on-line free dictionaries is that the dictionaries you buy are unabridged while free on-line dictionaries lack many entries and meanings and are not 100% reliable. Actually, the online contents of the Picchi-Hoepli and Rizzoli Sansoni, at least, seem to be exactly the same as the CD-version of these dictionaries (which I have on CD). As I mentioned in the post, in order to access the full contents of the Picchi, one has to register (free registration). All other advantages of purchasing the CD version of the dictionaries remain, of course. Grazie per il tuo site. A question. When I look at the Rizzoli site I can't find anything about a CD-ROM version. Please direct me to the appopriate site. Is the Picchi CD-ROM version a copy of the dictionary or is it abridged? Thanks a lot for your trouble. As regards the Rizzoli, it is not sold separately, I think it is only sold with the paper dictionary, which can be purchased either with the CD or without. The Picchi is complete, not abridge, at least the version I have (2003). Since I already have three good Ital-Eng/Eng-Ital Dictionaries, I'm only interested in getting a CD-ROM. What is the best CD-ROM I can purchase independent of the actual dictionary?